Whether you are sailing a dinghy or a catamaran there are a few basics that you need. You will most likely be getting wet due to the proximity to the water, so you need to be prepared with the right clothes and always take with you a change of dry clothes. Most sailors will wear a wetsuit for dinghy sailing – yes it does get that wet! This will be the layer that stays close to your skin and is designed to keep the heat in. You can vary how many mm you want the wetsuit to be depending on the conditions you will be sailing in. The thicker the wetsuit, the warmer you will be. If the conditions will be particularly cold then you can also use a thermal top under the wetsuit to give you an extra layer of warmth. If you are a diver, you may be tempted to use your diving wetsuit. Whilst this is ok for the first few attempts of sailing, it is not ideal as a long-term solution, the reason being the sailing wetsuits come with reinforced knees and seats, because you will be spending quite a bit of time with those areas rubbing up against abrasive surfaces. You will also find the design of the wetsuit fits the type of moving and seated position that you will be in for most of the time. This helps to make it more flexible to move about. If you are sailing in particularly hot conditions then sometimes the wetsuit can be replaced with a neoprene top that most divers and surfers will know as a rash vest. Make sure you buy one with UV protection to keep you protected from the sun. 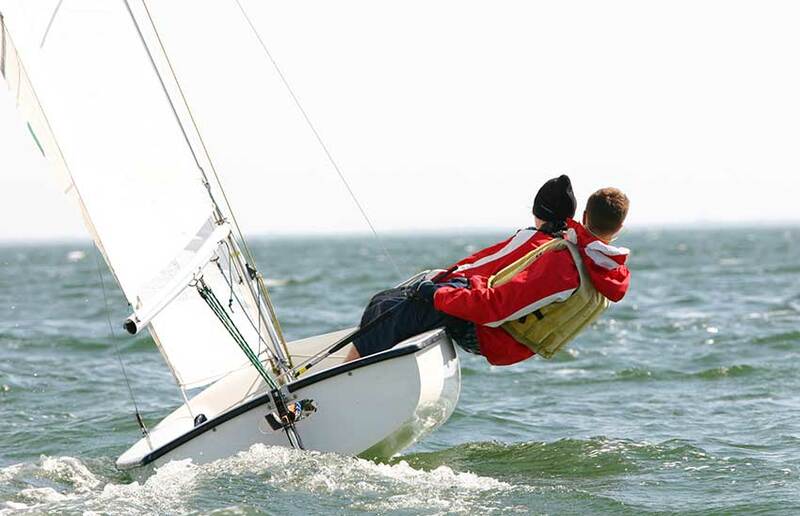 Depending upon the weather you may want to wear a smock over your wetsuit – this helps to keep some of the wind chill factor off of you – a good idea wherever you are sailing because ideal conditions for dinghy sailing are with a little bit of wind so expect the wetsuit to get cold from the wind. Look for a sailing smock that is breathable and waterproof. Gloves aren’t only worn in winter when dinghy sailing – they are really important for protecting your hands against abrasion. If you want to keep warm, there are plenty of flexible but warm neoprene gloves or if you prefer the ease of moving around without gloves, go for a pair of fingers gloves to protect your hands exposed to the ropes. Booties are a must for dinghy sailing – they help to protect your feet, prevent slipping at key moments and in cold conditions they help to keep the feet warm. They don’t necessarily keep your feet dry, being made out of neoprene, but they do offer a layer of warmth.